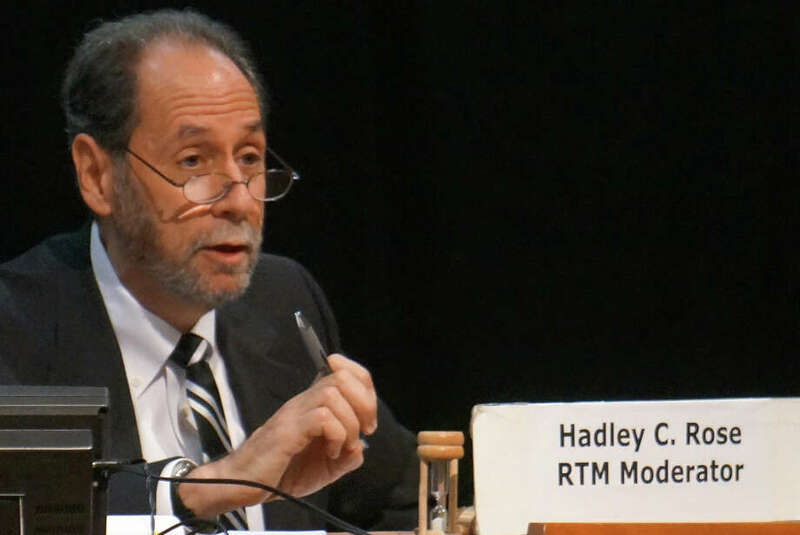 Hadley Rose was re-elected Tuesday to a sixth term as moderator of the Representative Town Meeting, while Eileen Flug secured a third term as deputy moderator. Both Rose and Flug received unanimous support for new one-year terms in the non-partisan legislative body's leadership posts. Rose was nominated by Matthew Mandell, District 1. "He's fair and he's dedicated, and has a passion to make sure things are done with respect and in the best interests of the town," Mandell said of Rose. Flug was nominated by Jeff Wieser, District 4. "We've all seen her in action as the deputy moderator of the past year and we've all witnessed the commitment to the work of this body that Eileen represents in all that she does," Wieser said of Flug. No other RTM members were nominated for moderator or deputy moderator. Rose was first elected to the 36-member RTM in 2003. He represents northern Westport's District 3. In his professional work, he heads Rose Container, a company that specializes in industrial packaging and consulting on hazardous material shipments. In his acceptance speech, Rose encouraged RTM colleagues to foster a civil and conciliatory tone in their proceedings. "Very few things are stark black and white," he said. "Someone disagreeing with you does not indicate a lack of judgment, as much as a difference of opinion. Reasonable people can, in fact, disagree. I would hope you all continue to keep that in mind." Flug won her first election to the RTM in 2005. She represents District 9, which encompasses most of the town center. Flug did not attend Tuesday's meeting. Town employee benefit plans have dominated the RTM's agenda this year. In February, the RTM unanimously approved the elimination of traditional pensions and other retirement benefits for new, non-union town employees. Related to the February vote, the RTM endorsed in October the creation of a defined-contribution retirement plan, in which new non-union town employees will deposit 3.5 percent of their annual base salaries. The town will make matching contributions to that plan. RTM members also approved this year two new union contracts. In April, they backed new terms for the town's public works union, conditions that had been set by a state arbitration panel. Most prominently, the new pact mandated that new public works employees enter a defined-contribution retirement plan. The legislative body also approved in October a new four-year contract for a small union of municipal workers. In May, the RTM approved a town budget for the current fiscal year of approximately $188 million. This fall, RTM members have also scrutinized developers' proposals for a senior residential complex at the town-owned Baron's South property, a project championed by First Selectman Gordon Joseloff. With the town set to issue a new request for proposals, RTM members have abandoned, at least for the moment, a proposed "sense-of-the-meeting" resolution to recommend that Joseloff's administration continue negotiations with Jonathan Rose Companies, the development firm endorsed in September by the town's Baron's South Committee.